THE BOSTON RELIGION is an indispensable guide to Unitarian Universalist history in and around the city. No UU resident of the region or visitor to Boston should fail to consult it. Peter Richardson has provided a treasure trove, a scavenger hunt of fascinating stories. 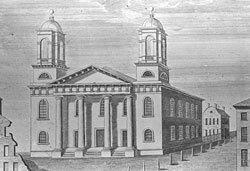 Discover the many lost and forgotten Boston UU churches, including those that moved and those that passed to other religious movements or uses. You will be richly rewarded! Theodore Parker was minister to the Twenty-eighth Congregational Society (Unitarian) in Boston in the 1840's. Today there are six or perhaps seven Unitarian Universalist Churches in the city. What happened? Peter Richardson's book, The Boston Religion tells us and gives us pictures of all of them - mostly imposing architect designed structures designed to seat many hundreds. This volume is indispensable for anyone interested in Unitarian history, academic, lay or clergy. First Unitarian Church, Portland OR. 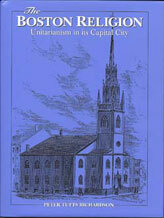 The Boston Religion describes the origin, institutional history, and decline of the 75 Unitarian congregations established in the City of Boston 1630-2003. Of these, only nine exist today as independent religious societies. 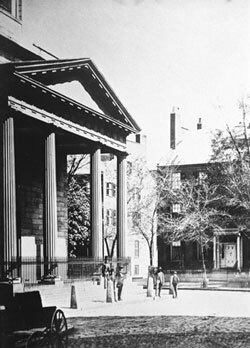 The segments on the Arlington Street Church (1729) and the Charles Street Meeting House (1949) are notable, as is the author's quo vadis that completes the book.